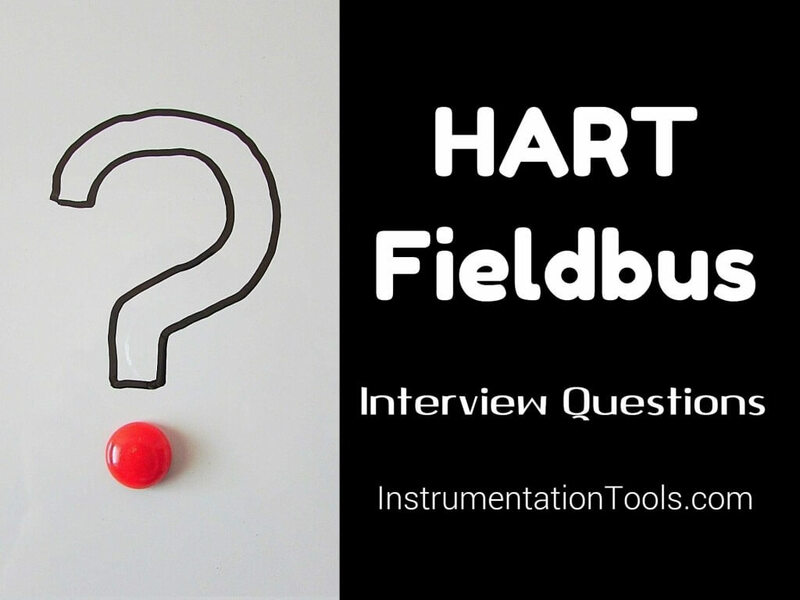 The following are the HART Protocol and Fieldbus Interview Questions listed with answers. This enables two-way field communication to take place and makes it possible for additional information (tag numbers, measured variables, range & span data) beyond just the normal process variable to be communicated to/from a smart field instrument. The HART protocol communicates at 1200 bps without interrupting the 4-20mA signal and allows a host application (master) to get two or more digital updates per second from a field device. As the digital FSK signal is phase continuous, there is no interference with the 4-20mA signal. 2. Give the HART specifications? set of commands to perform required operation. 3. Write a brief note on HART signal Levels? HART protocol specifies that master device transmit a voltage signal whereas slave device transmits a current signal. The current signal is converted in to corresponding voltage by a loop load resistor, so all devices use voltage sensitive receiver circuits. The wave shape is sinusoidal, but trapezoidal waveform is acceptable. A square wave is not acceptable. 4. Write a note on master slave operation? HART is a master-slave protocol. That is each message transaction is originated by the master station, the slave device only replies only when it receives a command message. The reply from the slave device acknowledges that the command has been received and may contain data requested by the master. 5. Write a note on multi master operation? HART protocol allows two active masters in a system, one is “primary master”, another is “secondary master”. Primary master would be the control system secondary master may be a hand-held communicator or a maintenance computer. 6. What are the two modes of communication modes of HART? Maximum communication speed in normal mode is 2 message/sec. It performs a normal master-slave operation. To achieve a high data rate a burst mode is used. The communication speed is 3 message/sec. In burst mode a slave device repeatedly sends a data message as though it had received a specific command to do so. 7. What are the two types of frame formats in HART protocol? Older HART instruments (Version 4) used short frame format. In this the address of the slave device is ‘o’. HART version 5 introduced ‘Long frame format”. In this the address of the slave device is world-wide unique identifier. It is a 38 bit number derived from the manufacturer code. It contains the device code and device id no. Long frame format gives extra security against the possible reception and acceptance of command meant for another device, either due to external interference or due to excessive cross talk. 8. What are the different groups of HART commands? Universal: Provides functions which are implemented in all field devices. Provides functions common to many field devices but not all. If a device uses these functions, these commands should be used to perform them. 9. What are the different HART networks ? In point-to-point mode, the traditional 4–20 mA signal is used to communicate one process variable, while additional process variables, configuration parameters, and other device data are transferred digitally using the HART protocol. The communication takes place between two devices . The multi drop mode of operation requires only a single pair of wires and, if applicable, safety barriers and an auxiliary power supply for up to 15 field devices All process values are transmitted digitally. In multi drop mode, all field device polling addresses are >0, and the current through each device is fixed to a minimum value (typically 4 mA). 10. Write a note on HART compatible multiplexers? HART-compatible multiplexers are ideal for users who want to interface with a large number of HART devices. Multiplexers can be modular and are capable of supporting both point-to-point and all-digital (multi drop) HART communication modes. Communication between a multiplexer and a host application depends on the multiplexer capabilities (e.g., RS232C, RS485, Modbus, and TCP/IP Ethernet). 11. What are the capabilities to be considered in selecting a HART multiplexer? Method of communication with the host computer or control system. 12. What is meant by pass-through feature? Some control systems are integrated with a configuration or instrument-management application. In these systems, the control system passes a HART command, issued by the management application, to the field device via its I/O interface. When the control system receives the reply from the field device, it sends the reply to the management application. This function is referred to as a pass through feature of the control system. 13. How is the HART protocol linked with OSI model? The HART protocol utilizes the OSI reference model. As is the case for most of the communication systems on the field level, the HART protocol implements only the layers 1, 2 and 7 of the OSI model. The layers 3 to 6 remain empty since their services are either not required or provided by the application layer 7. 14. What are the features of HART protocol? Open de-facto standard freely available to any manufacturer or user. 15. What is meant by Device Description(DD) ? Some HART host applications use device descriptions (DD) to obtain information about the variables and functions contained in a HART field device. The DD includes all of the information needed by a host application to fully communicate with the field device. HART Device Description Language (DDL) is used to write the DD, that combines all of the information needed by the host application into a single structured file. The DD identifies which common practice commands are supported as well as the format and structure of all device-specific commands. A DD for a HART field device is roughly equivalent to a printer driver for a computer. 16. What is meant by fieldbus ? Fieldbus is an all digital, serial two way communication system that interconnects devices such as sensors, actuators and controllers. Fieldbus replaces the 4-20mA standards. It is a LAN for instruments with built in capability to distribute a control application across the network. 17.What are the advantages of fieldbus? Filed bus allows many pairs of wires to be connected to a single pair of wire. Provides more reliable data for control. Interoperability is defined as :-“The ability to operate multiple devices, independent of manufacturer, in the same system, without loss of minimum functionality”. Interoperability allows mixing devices from different manufacturers on the same fieldbus and allows replacing a defective device with a device from a different vendor. 19. What are the main two components of interoperability? 20. What is meant by function blocks? Function blocks provide common structure for defining inputs, outputs, control algorithms, events, alarms & block control diagrams. The common function block ensures system integrity. Function blocks allows timing and synchronization of control strategies so that system schedules can be built. 21.What is meant by device description? A device description is a driver for the device. The DD includes the operating procedures, variable descriptions and other information’s required by the host. DD’s are written using Device Description Language. In digital oriented systems, each company product follows their own standards. If in a system with two different operations, one fails and device with slight change can do the other device’s operation it is known as interchangeability. 23.What are the different field bus topologies? 24.What is meant by Bus with spur topology? With this topology, the fieldbus devices are connected to the bus segment through a length of cable called a spur. A spur can vary in length from 1m to 120 m. If spur is less than 1 m it is called splice. 25.What is meant by daisy chain topology? With this topology the field bus cable is routed from device to device on the segment and is interconnected at the terminals of each field bus devices. 26.What is meant by communication stack? The communication stack is comprised of layers 2&7 in the OSI model(Data Link & Application layer). 27.What are the two types of fieldbus? low speed(31.25 kbps), error proof transmission, used for control applications such as temp, level and flow control. 28. What is meant by report distribution type VCR? The report distribution VCR type is used for queued, unscheduled or user initiated one-to-many communication. It is used by field bus devices to send alarm notifications to the operator consoles. 29. What is meant by publisher/subscriber VCR type? It is used for buffered(scheduled), one-to-many communication. Publisher/subscriber VCR type is used by the field devices for cyclic, scheduled publishing of user application function block input and output such as process variable and primary output on the field bus. 30. What is meant by Fieldbus Message Specification(FMS)? FMS services allows user applications to send messages to each other across the field bus using a standard set of message formats. FMS describes the communication services, message formats and protocol behavior. 31. What is meant by object description? Data that is communicated over the field bus is described by an object description. Object description are collected together in a structure called an object dictionary. 32. What are the operations of a LAS? 33. What is meant by Live List? The list of all devices that are responding properly to the Pass Token (PT) are called the Live List. 34.What is meant by Virtual Field Device? A VFD is used to remotely view local device data described in the object dictionary. A typical device will have at least two VFDs. Very Very Helpful Article. Thank you very Much Sir.